In this article we will learn about how to generate QR code from a input text and read the QR code on button click. Generate QR code and Read QR code using Asp.Net C#. In previous articles we have learnt Configure Setup(Installer) project in VS2015. What is CTE in SQL and use . If Else and Case statement , While Loop . What is Cursor in sql and use of cursor. Difference between Row_Number(), Rank(), Rank_Density() with example. 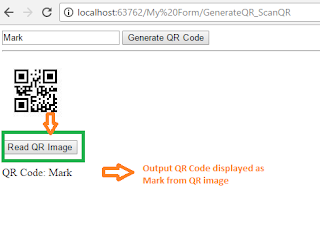 We can generate QR code and also read data from generated QR code image using Zxing.Net in Asp.net application. You can add Zxing.Net library directly from package manage console. 1. Add a Asp.Net Web Application and gave a suitable name to it. 2. Add a new Web Form on it and gave a name to it. 4. Search for Zxing.Net and then click on Install and wait for installation process to be finish. 5. After successfully installation of Zxing.Net, go to the added Web form on step 2. 6. Just copy the below given aspx code and paster on your Web-Form. <asp:Button ID="btnGenerateQR" runat="server" Text="Generate QR Code"
<asp:Image ID="imgQR" Width="100px" Height="100px" runat="server"
<asp:Button ID="btnReadQR" Text="Read QR Image" runat="server"
7. Go to Code View on aspx.cs page and paste the all code given below. 9. Enter any text and click on Generate QR code button. 10. Click on Read QR Code , the text from that QR image will be displayed.